Purr by Katy Perry eau de parfum begins with the aroma of peach nectar and forbidden apple, evolves with a distinct floral bouquet of jasmine blossom, Bulgarian rose and vanilla orchid, and slowly reveals accents of creamy sandalwood and musk. Like the singer herself, Purr is playful yet sophisticated. Katy Perry transcends barriers with her music—so does her new fragrance. I love this perfume, it smells great! I bought it because one of my friends wore it and I loved the smell of it. The value is great, since the size of the bottle is definitely worth the price. What I love most about this product is the fact that you can smell it on my skin. Most perfumes do not sink into my skin since I have very dry skin. I love this! 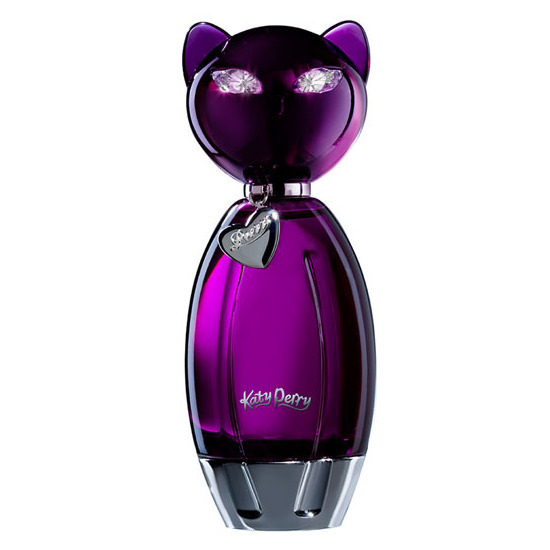 Purrr by Katy Perry is purrrlicious, the fragance is adorable, fruitlicious and perfect for a summer night out. The fragance is perfect if you love others like I lowe you, or any other florals. I bought this scent right after it came out and I still have a good amount, enough for maybe 5-6 uses, left! It smells amazing and I definitely want to re-purchase. I always get complimented when I wear it! Not to mention, it's a very good price. The scent isn't too strong or too flowery, it's a very good balance and I love that. i first got my friend it, and she loved it! so i got a mini bottle for myself and i am in love with it! this is a must have! This is my all time favorite perfume ever.Just got it for christmas and can't stop using it! I love cats and for any cat lovers too this bottle and scent is a must-have. Its got a musk scent but also very sweet. I got the small size with body wash & lotion. It's a very seductive smell. How can anyone go past this gorgeous purple cat bottle? I can't. So my darling Mum bought it for my birthday. It's a really lovely scent I would use everyday, if I wasn't worried about it running out! It's definitely up there with my favorite perfumes at the moment. purple kitty bottle.....yes please. The smell is great and the bottle is better. I also have the meow in the solid necklace. Good Job! I think I put this stuff on everyday, I bought the gift pack from Penny's, came with the glimmer lotion, body wash, purse bottle and the beautiful kitty bottle, for $60! Can't beat that! I've used just about everything up I love the smell so much!